﻿Published by Sareth Ney on June 16, 2017 at 5:31 a.m.
Photo credit: John Mulaney's Facebook page. 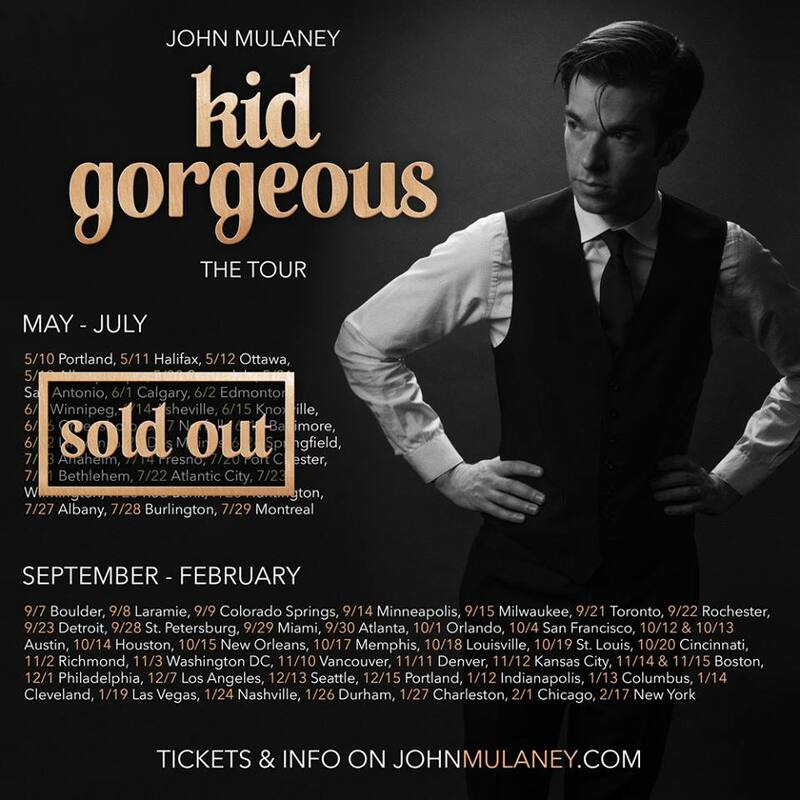 ORLANDO, Fla. – John Mulaney’s winter and fall leg of the Kid Gorgeous Tour will make a stop at Hard Rock Live, on Oct. 1. The trek begins on Sept. 9 in Colorado Springs, Colo. It will conclude on Feb. 17 at Radio City Music Hall in New York. He is an actor, producer and writer. As an actor, Mulaney has appeared on the following television productions: “Jump Cuts”, “Invisible City”, “Balls of Steel”, “Human Giant”, “I Love the ‘30s”, “Atom TV”, “The Oh, Hello Show”, “Important Things with Demetri Martin”, “Mayne Street”, “Saturday Night Live”, “Ugly Americans”, “The Soup”, “Mulaney”, “Kroll Show”, “Bachelor Live”, “Lady Dynamite”, “Comedy Bang! Bang!”, “Difficult People”, “The Jim Gaffigan Show”, “Nothin’s Easy”, “Late Night with Seth Meyers” and “Oh, Hello on Broadway”. He was one of the writers for the upcoming television series, “Big Mouth”. Mulaney was credited as a writer on the following: “Cavalcade of Personalities”, “I Love the ‘30s”, “Atom TV”, “The Oh, Hello Show”, “Mike Birbiglia’s Secret Public Journal”, “Important Things with Demetri Martin”, “Comedy Central Presents”, “Saturday Night Live: Just Shorts”, “The Very Funny Show", “2011 White House Correspondents’ Association Dinner”, “John Mulaney: New In Town”, “Funny as Hell”, “Saturday Night Live: Weekend Update Thursday”, “Comedy Central Roast of James Franco”, “Mulaney: An Opening Act”, “Saturday Night Live”, “Saturday Night Live: 40th Anniversary Special”, “Mulaney”, “John Mulaney: The Comeback Kid”, “Maya and Marty”, “Documentary Now!” and “Oh, Hello Broadway”. ​Awards and accolades Mulaney has accomplished include one Primetime Emmy win, in 2012. He was also nominated in: 2009, 2010, 2011, 2013, 2015 and 2016. He won one Writers Guild of America, USA (WGA) Award for television, in 2009 and 2010. He was nominated several times over for a WGA Award in the following years: 2012, 2013, 2014, 2016 and 2017. In 2012 and 2013, he earned one nomination for a PGA Award. On June 21 at 10 a.m. Eastern Time, tickets to attend Mulaney’s stand-up comedy performance at Hard Rock Live will be made available to purchase. To receive a special code via email to purchase tickets prior to anyone, visit his website and submit the following: email, first name, last name, postal code, birthday and check off cities for the pre-sale code. Four tickets is the limit, for forms entered. When signing up, one agrees to be part of his email newsletter. For more information, send an email to kidgorgeoustour@gmail.com. Sept. 7 - Boulder, Colo.
Sept. 8 - Laramie, Wyo. Sept. 9 - Colorado Springs, Colo.
Sept. 15 - Milwaukee, Wis.
Sept. 22 - Rochester, N.Y.
Sept. 28 - St. Petersburg, Fla.
Oct. 1 - Hard Rock Live, Orlando, Fla.
Oct. 17 -The Orpheum Theatre Memphis, Memphis, Tenn.
Oct. 18 -Louisville Palace, Louisville, Ky.
Nov. 2 – Richmond, Va.
Nov. 12 - Kansas City, Mo. Dec. 15 - Arlene Schnitzer Concert Hal, Portland, Ore.
Jan. 24 - Ryman Auditorium, Nashville, Tenn.
Jan. 26 - DPAC - Durham Performing Arts Center, Durham, N.C.